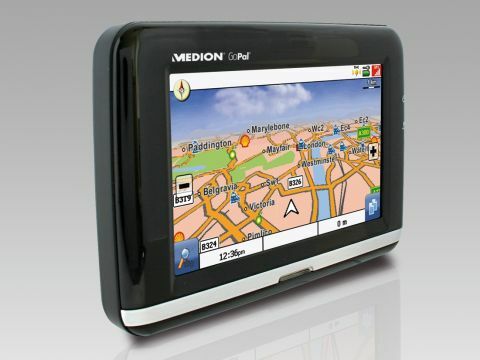 Budget electronic manufacturer Medion, a company that sells its products through supermarkets, is attempting to take on TomTom in the satellite navigation market. The Medion GoPal PNA460 (£199 inc. VAT) is a mid-range GPS device, and offers mapping for the UK, Ireland and Western Europe. The 4.3-inch widescreen display is larger than that found on most rivals at this price point, which leaves no room on the front for hardware buttons. This makes navigating the menu a slower process than with rival products - and key features, such as volume, have to be adjusted via the touchscreen. We did find the interface simple and easy to use, however. The 480 x 272-pixel touchscreen is bright and we found it easy to see, even in direct sunlight. Addresses or full postcodes are entered using an onscreen Qwerty keyboard. A stylus is provided, although we found this was mostly redundant thanks to large onscreen buttons. A SiRF Star III GPS module provides an accurate location, although we found it a little slow to find satellites initially. The maps are provided by Navteq, and are bright and colourful. Directions were easy to follow and accurate, and the perspective of the maps can be changed from 2D to 3D. Points of interest are included - such as petrol stations and banks, and there's also a Berlitz guide for the major European cities. This provides a more in-depth guide, although it's a shame information is not included for more than 50 cities. It's not the most feature-packed device we've seen - there's no Bluetooth, and there's also no Traffic Message Channel, so you won't get warnings about congestion, although speed camera warnings are present. However, while the GoPal isn't the most comprehensive sat- nav device we've tested, there's a lot on offer for your money. It's accurate, easy to use, and the large screen makes it a compelling choice.